Biology major Krisha Tonne of Jesup, Iowa, is pictured assisting Grace Recker of Arlington during part of the UIU STEM Camp Food Biochemistry Lab. Young people from as far away as Antioch, Illinois, participated in the recent STEM Camp at Fayette Campus. 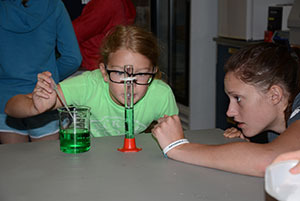 Over a dozen youth in grades 5-8 participated in Upper Iowa University’s recent Summer STEM (Science, Technology, Engineering and Mathematics) Camp at Fayette Campus. While working alongside University professors Dr. William Jones, Dr. Rebecca Schmidt, Dr. Jeff Butikofer, Dr. James Jacobs and Laura Gleissner, and a select group of undergraduate students, camp participants were provided hands-on experiences during the four-day event. Explore Your Senses – Have you ever considered how you actually see, taste or feel? This lab will explore your sense of taste, hearing, touch and equilibrium. Fish Age – Did you know that fish have ears? And if so, did you know that you could determine how old a fish is by looking at bones in their ears? Learn how to determine the age of a fish. Pond Water is Full of Life – Many organisms are too small to see. Explore these life forms on a microscopic level. Drypoint Printmaking – Learn the art of drypoint printmaking. Create original works of art by pulling inspiration from the shapes and textures found in nature. Cyber Camp – Learn how computer programming and robots come together to develop fun and useful solutions to problems. Food Biochemistry – How much protein? What types of sugar? Use chemistry techniques to investigate the biological molecules that make up food. Upper Iowa University is a STEM Jobs Approved College. The special recognition is for colleges and universities that provide broad and innovative STEM degree options for undergraduate students, actively recruit underrepresented and under-prepared students into STEM degrees, as well as offer targeted student support systems and career services to help students succeed.